Outstanding job ( as always )! Ð‘Ð¾Ð»ÑŒÑˆÐ¾Ðµ ÑÐ¿Ð°ÑÐ¸Ð±Ð¾, Ð¼Ð¾Ð¹ Ð´Ð¾Ñ€Ð¾Ð³Ð¾Ð¹ Ð´Ñ€ÑƒÐ³. This update was really a hard one. Vehicles in Arma3 are a nightmare. Awesome, that M2A2 is sweet! Any update on the scope bug affecting the vanilla sniper units? 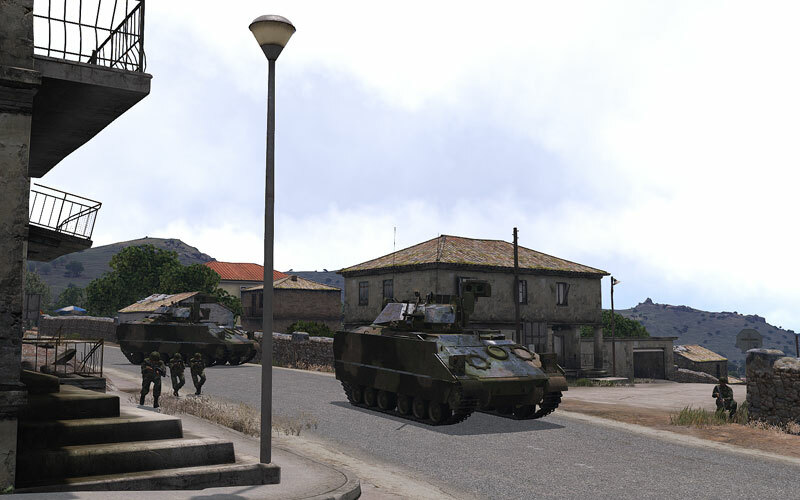 This is awesome, definitely an addon I am glad to add to ArmA 3! I was wondering if perhaps in a later release there could be some tan uniforms for the Soviets, such as what was worn in the Afghan war? - It sounds like not every shot fired by the M2's cannon is heard. You might want to check the config for any bursts to make sure that they say soundBurst=false, or else only a single shot's audio will be played. Haven't tested the BMP2 yet. Updated alpha version frontpaged on the Armaholic homepage. Thanks for the advice. I will check this. Awsome job mate, looks like ill have to update my missions! and start workin on the next one once I get back from sea. Thanks heaps for the mod. Man great update, sudden you are the man :) Claps all around. Looking forward to future updates. Maybe a Patton for the US forces. That would be cool! Cheers sudden, some vehicle crews and extra infantry units would be awsome. I reckon there would be some kind people out their that would let you use their plane and helo models for future updates, if the mod community is what I remember it to be. Thanks cam, when's your next mission coming out mate? Thanks cam, when's your next mission coming out mate? Love the new update! Although, I notice after driving straight for a few seconds the BTR-60 wobbles like crazy, otherwise all is good. It says on your Make Arma Not War page you're working on AGS-30 and Kornet, both of which came out in 1990s. If you haven't already started, would a AGS-17 and a Metis or Konkurs possibly be more appropriate? Metis would make a good counterpart for the M47 Dragon from OA. Good luck in the competition though Sudden! Can't wait to see those T-72s, M1s, marksmen and recon infantry! As I said earlier configuring vehicles with new physX is a nightmare, because there're no rules, you have just to change values and see what's happen. It takes the hell amount of time and patience. Any information on this would be much appreciated! Thank you all very much for the feedback! Sudden you should have told us that you have applied to the MANW contest! I've already supported it! ( here is the link if anyone else want to support it too ). I'm really looking for the new sniper rifles you commented there. BTW is in your plans to add some static mortars? ( that would be really cool, because we could use them as artillery and I guess are not as complex as the vehicles ). The support trucks would make a nice addition too ( I guess you can almost copy paste from the other ones ). Similar with the M113 with the Vulcan. When the time comes from the air vehicles, I think the Kiowa would be really cool, as they were deployed in Berlin and it has been missing since the first OFP ( I guess you can get it from the OFP open content ). Another cool thing would be to animate the ramps of the Bradley and M113 so they would descend to allow the dismounts to get out fast ( it has been done in other mods ). And last but not least, maybe the inclusion of the M249 ( used since 1984 ) and the RPK would add some variety in the infantry light MG section ( it's in service since 1961 ). Can you please give a link to a mod where the ramp feature was implemented? P.S. Yesterday I was playing with user interface and found some new cool features. For instance, it seems that it's possible to make laser range device for tanks that work with a key press. Thank you very much! It seems that I came to the same conclusion that tweaking suspension helps. But it's far away from the parameters that you can see in Config Guidelines. I have been editing the handling for the EvW vehicles (Great job, btw) in order to make them correspond to the real one and it seems the wobbling issue had to do something with the antiRollbar (Its generally a nice idea to turn it off in order to avoid a lot of issues), where it would always push the vehicle to one side in order to compensate for a slight roll and then it would push it back again from the other side. When one would accelerate the time it would overcompensate a lot giving a strange effect. If you want to take a look at the redone handling, let me know. 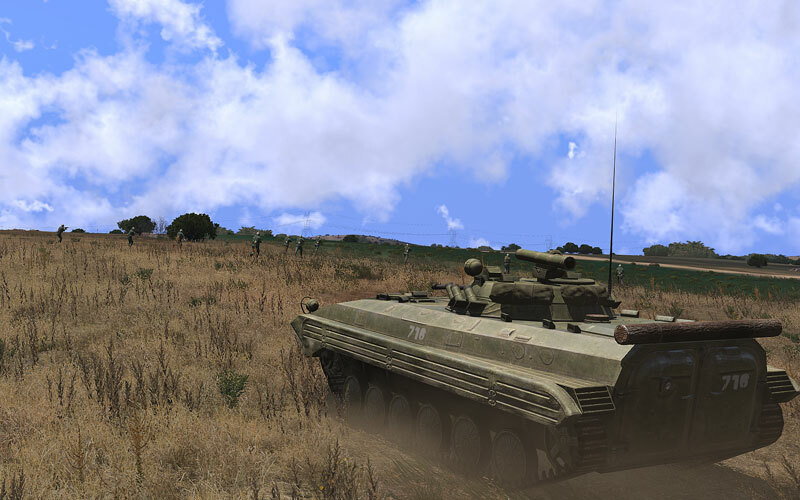 So far the UAZ 469, the BRDM-2 and the BTR-60 have gotten realistic handling. Both of them have even M113 with mortars inside and other fancy things ( but I guess that is going too far ). That sounds awesome! Would be really cool to call and guide artillery / CAS from a tank. Small thing, wouldn't it be RPK-74 if this takes place in the 1980s? Also, could we get M60s and T-64s or a similar tank of the era, eventually? It'd make sense if we wanted to have combat taking place before the Abrams was widespread.